Love Oatmeal Raisin Cookies? Go ‘ga-ga’ for Granola Bars? 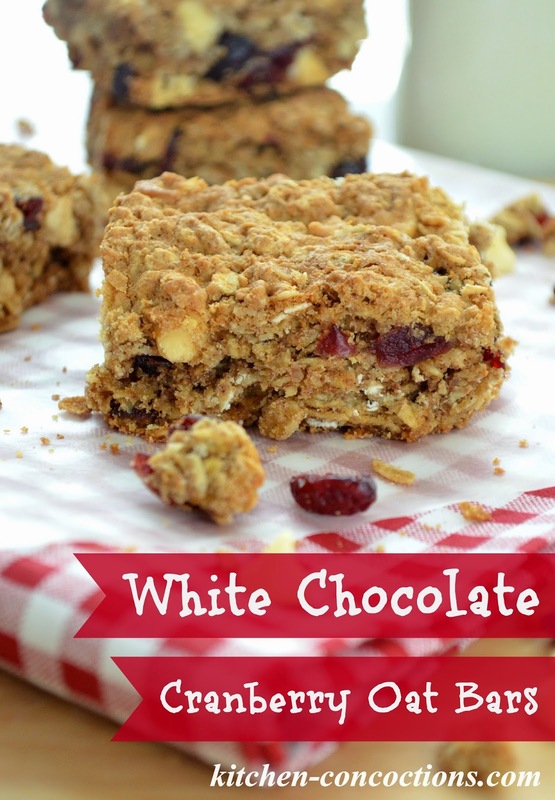 Well, these White Chocolate Cranberry Oat Bars, packed with festive fall flavors, taste just like an oatmeal cookie only in granola bar form! My Mom is one smart cookie (pun totally and completely intended… sorry y’all!). You see she has very good logic when it comes to breakfast. She fully believes that on weekends, a big hearty breakfast is a must… a theory and practice I fully support! For her, a big breakfast must not only include eggs and sausage (or bacon) and fruit (or orange juice), but must include some sweet treat, like cinnamon rolls, donuts, or banana bread (the fact that “dessert” for breakfast is totally allowed in this world makes me squeal with delight!). I mean how can you NOT have all these things (or more) as part of your weekend morning routine! For a recent girl’s weekend, with my Mom and sisters, I whipped up these bars to bring along for an afternoon snack/treat. We ended up not eating them that day, so my Mom said she was going to serve them with breakfast the next morning. However, my Mom called these oat bars brownies and my sister just couldn’t believe my Mom would serve us brownies for breakfast. In my Mom’s defense, I quickly jumped in and explained that despite my Mom’s argument that brownies were no different than cinnamon rolls, these weren’t brownies. 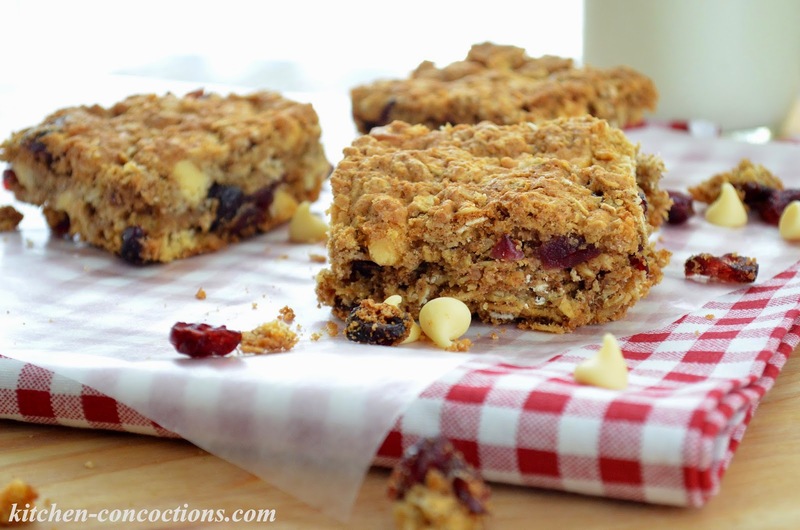 These were oat bars and they were like granola bars; and since they had whole wheat flour, rolled oats and dried fruit, they were perfectly acceptable for breakfast. After learning all that, well my sister was 100% on board for some White Chocolate Cranberry Oat Bars for Sunday morning breakfast! 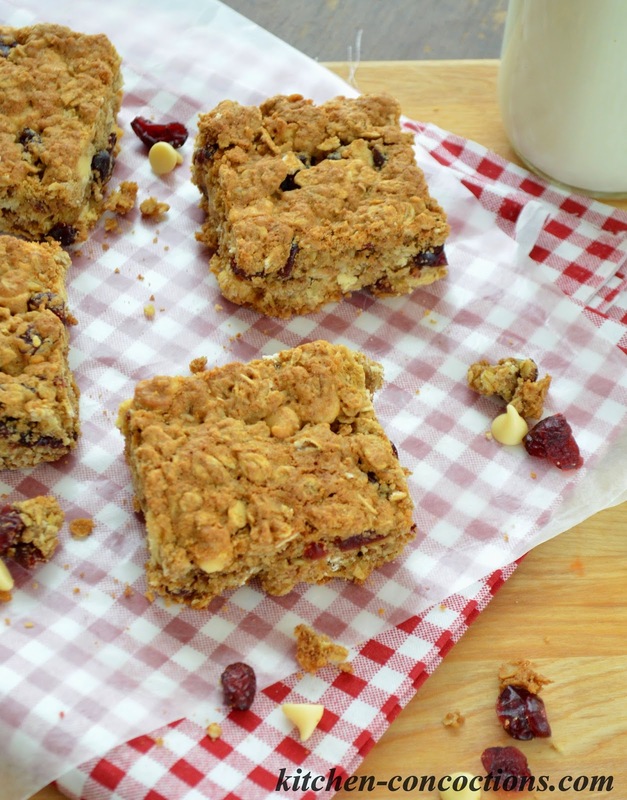 Crispy snack bars loaded with white chocolate, dried cranberries and rolled oats. Heat oven to 350°F. Line a 9×13-inch baking pan with parchment paper or spray with non-stick spray. In a medium sized bowl, stir together both flours, baking soda, cinnamon and salt. Set aside. In a separate large bowl, cream together butter and both sugars until creamy. Add eggs, one at a time, mixing well after each addition. Add vanilla and beat well. Slowly add the flour mixture, a little at a time, to the butter mixture, mixing until fully incorporated. 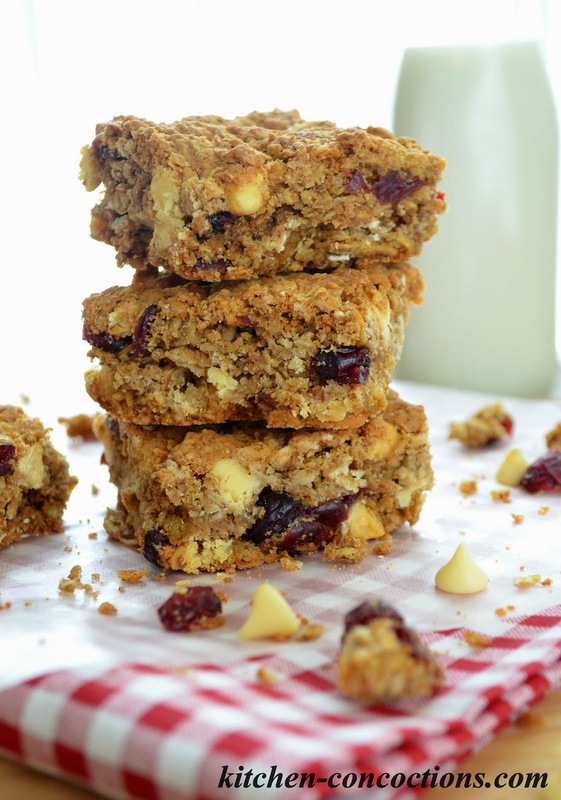 Stir in oats, white chocolate chips and dried cranberries. Press dough into the bottom of prepared 9×13-inch baking pan. Bake for 25 to 30 minutes or until light golden brown. Allow bars to cool completely before cutting. Store tightly covered at room temperature for about 5-6 days.